The first stopover for the Char Dham Yatra is the westernmost shrine of Yamunotri in the Garhwal Himalayas. Dedicated to Goddess yamuna, it is perched atop a flank of the Bandar Poonchh peak (3.165 mts. Above sea level) and is situated opposite to Gangotri. The shrine attracts devotees in large numbers from May to October. Yamunotri is the source of the revered river yamuna which originates from the Champasar Glacier lying 1 km ahead of the shrine, at an altitude of 4,321 mts. Pilgrims do not frequently visit the source of the river as it is not easily accessible. The picturesque pilgrimage in the hinter lands of the Himalayas is the most sacred spot where Ganga, the stream of life, touched earth for the first time. According to mythology, Goddess Ganga - the daughter of heaven, manifested herself in the form of a river to absolve the sins of king Bhagirath's predecessors, following his severe penance of several centuries, Lord Shiva received into his matted locks to minimize the immense impact of her fall. She came to be called Bhagirathi at her legendary source. 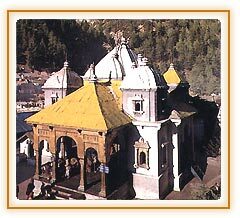 Along the right bank of Bhagirathi stands the shrine of Gangotri dedicated to the Goddesss. Perched at a height of 3.042 mts., it was constructed in the early 18th century by a Gorkha Commander, Amar Singh Thapa. Rishikesh Arr.01.00 P.M Dep. 04.00 P.M.